Backs have keyhole punching for easy wall mounting and top, bottom, sides, and backs are prepunched to attach to other Cubix lockers. This listing is for each. Technical Specification Item - Box Lockers Box Locker Locker Door Type Ventilated Assembled/Unassembled Unassembled Locker Configuration (1) Wide, (1) Tier Number of Openings 1 Hooks per Opening None Opening Width 9-1/4' Opening Depth 11' Opening Height 11-1/4' Overall Width 11-5/16' Overall Depth 12' Overall Height 12-11/16' Color Light Gray Locker Material Steel Finish Powder Coated Legs Included No Locker Handle Type None Locker Lock Type Keyed Includes Number Plate Green Environmental Attribute Minimum 50% Post-Consumer Recycled Content Locker Color Family Grays Compliance and Restrictions This item is restricted for international sale. - This item has been designated by the manufacturer as an environmentally preferable product (EPP) because this item is Minimum 50% Post-Consumer Recycled Content. 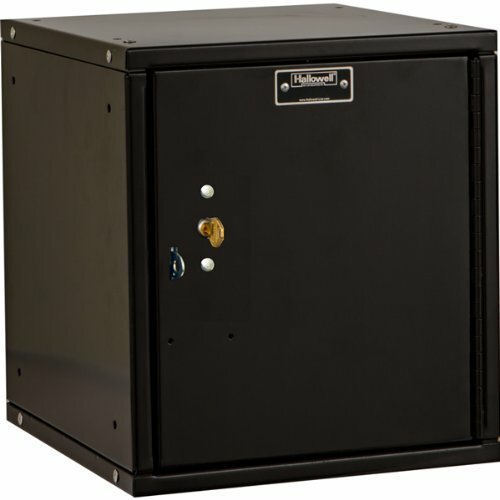 Sandusky Lee Kids Locker, LF1B151524-09 Single Tier Welded Steel Locker, 24"